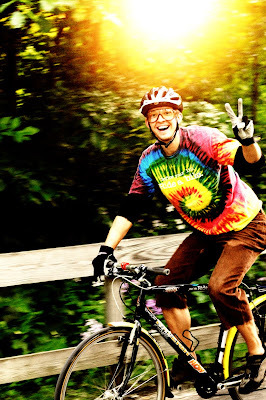 Century Cycles Blog: Extra fun planned for last Night Ride on 10/9! Our last Century Cycles Night Ride on the Towpath Trail of 2009 is Friday, October 9, and we’re planning a fun finale to our best Night Ride season ever! Recently named a great local ride by Bicycling Magazine, Night Rides are FREE group bicycle rides on the Towpath Trail led by Century Cycles that don't require any registration or RSVP. They start at 8pm in the parking lot of the Peninsula store (parking is in the Lock 29 parking lot or its overflow lot). Helmets and bike lights are REQUIRED and VERY NECESSARY. (The sun will have set before we set out). Children 15 and younger must be accompanied by an adult. So whether come in costume or not, mark your calendar to join us on October 9th and bike the last Night Ride of the year! Weather-permitting, I may come out to this one with Beau! I should have my purple-black bar tape on him by then so he should look pretty spiffy.